A proud homeowner is a happy homeowner. When you’ve lived in the same house for several years, whether you purchased it brand new or used, you’ve likely invested countless hours (and dollars) improving your home’s space. From your furniture selection in the living room to painting bedroom walls and creating the ultimate backyard hangout space, there truly are many aspects of your home to pride yourself on. What’s interesting is that, though you spend the vast majority of your time at home indoors, your neighbors and other passerby only get to see the outside of your house. Perhaps this is why most dedicated homeowners prioritize their yard over nearly anything else, being that this is the only true element of control over someone else’s impression of your property. Your Lawn Sprinkler Company In Toms River Cares About Your Yard! More simply put, people care about their yards and they have a lot of questions about how to do the best possible job. Though we primarily specialize in sprinkler repair and sprinkler installation in Toms River, NJ here at A & C Sprinkler, we’re as invested in the health of your yard as you are. That’s why we also offer yard drainage services in addition to sprinkler blowouts (winter is coming! ), irrigation system solutions, and landscaping lighting. 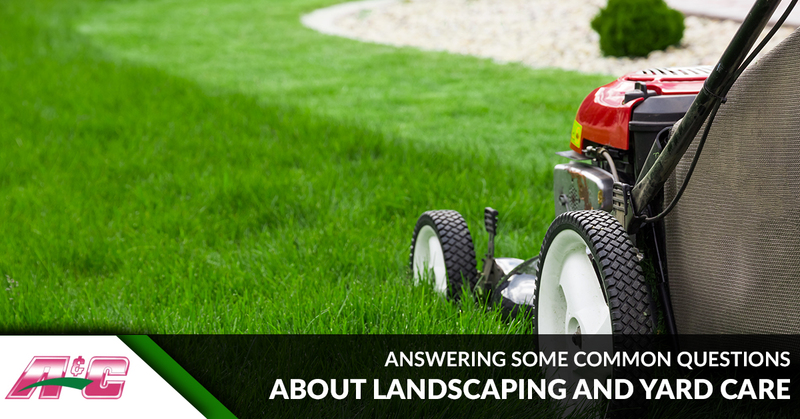 Here are some of the most pressing questions — answered — about optimal yard care. How Often Should I Cut My Grass? You certainly shouldn’t mow everyday, and mowing once a month would mean that you’re navigating through a jungle. Generally speaking, most average homeowners mow their lawn about once a week. The realistic answer is simply to mow it as it is needed. It’s important to note that the longer your grass is, the less it requires water because it starts to shade itself at a certain height. So, during a drought season with little to no rain, mowing less often will mean that you won’t have to use as much water. What’s The Difference Between A Sprinkler System And A Drip Irrigation System? Both of these systems are effective ways to water your lawn and surrounding plants, but they do have some notable differences. If you’ve ever noticed those small, thin, black rubber hoses in a flower bed or a garden, what you’ve seen is a drip irrigation system. As the name would imply, water drips from a number of small holes in the tube and soaks into the soil, provide ample amounts of water for the plants’ roots. Sprinklers are better designed for watering most lawns, and they’re something that our team is well versed in fixing and installing. Sprinkler systems quite literally sprinkle water into the air, providing an even application of water onto the surface of your grass. Why Does Grass “Die” In The Winter? This answer is remarkably simple: your grass doesn’t die. It does, however, become dormant, meaning that it turns an ugly shade of brown. While that’s not too easy on the eyes, your grass is doing this to intentionally conserve water and “hibernate” during the chillier months. Even something as seemingly simple as grass appears to have a mind of its own! How Often Should I Replace The Soil In My Garden And Planters? Not unlike a fine wine, your soil will actually get better over time. This means that you shouldn’t necessarily replace your soil and throw out the old stuff, but rather, buy new soil and progressively add it into the existing mixture. Things like yard clippings, dead leaves, old flowers, and other organic debris can help boost the quality of your soil thanks to their nutrient-rich qualities. As for “how often,” our sprinkler repair experts recommend revitalizing your soil about once a year, maybe twice a year if you happen to live somewhere where you can have an outdoor garden year-round. Should I Try And Tackle Sprinkler Repair Or Installation On My Own? Consider this a shameless plug, but we think that something as integral to the health of your grass and plants should only be handled by a dedicated expert. Sure, you might save some money up front, but dealing with your own irrigation problems is time-consuming, effort-intensive, and may worsen the situation down the line. We Have Irrigation Solutions In Toms River Covered! Whether you still need a blowout or you have more questions about your home’s irrigation system, A & C Sprinkler is here to help. Contact us today. Read More About Taking Care Of Your Yard With Us!